Dropped off one gloomy afternoon at Lets Live Together’s office, she was just a two months old. It seemed like she was a house puppy abandoned only because she was a girl. Sadly, she was weak, could barely walk, and looked like she hadn’t been fed well for some time. We found her a foster home that could take her in only for a couple of days. Our vet found that she had a lung infection. This required twice daily vet visits for drips and injections. The foster parent then said she could stay until she recovered, and Let’s Live Together was taking care of all the medical expenses. A week went by, and we visited her foster home to check on our little baby. Her health had improved dramatically. She looked a lot better, energetic, active, and adorably playful. It was extremely comforting to see her recovering well. After twelve days of continuous treatment all our prayers were answered. Our little darling had completely recovered and was now healthy and active. During the course of time we named her SILKY. Now the time had come for her to move on and find a loving home. However, as fate would have it, Yogitha, the foster parent, found she had fallen in love with Silky. Though hesitant in the beginning, she had formed an unbreakable bond with Silky over the course of her treatment. Yogitha and her mom decided to adopt Silky. 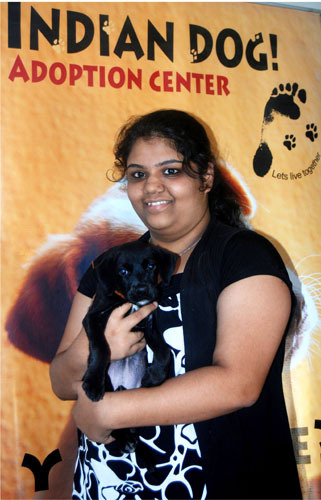 They came to our office to fill in the adoption form along with other formalities, and took Silky home forever. Our little angel dropped by Lets Live Together’s office, for a visit, to tell us all about her Loving Forever Home. 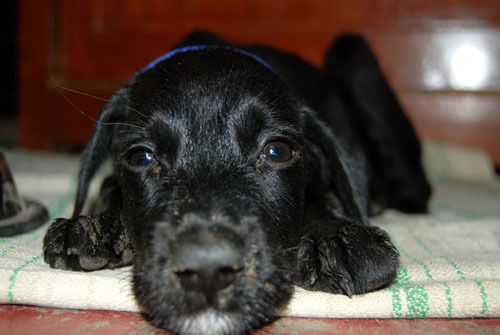 Let’s Live Together is a registered animal protection organization for the welfare of homeless animals in Bangalore. Let’s Live Together’s INITIATIVE, Project ‘life on the street,’ promotes the concept of people adopting homeless puppies instead of buying dogs. ADOPTION definitely helps in solving the street dog issue, sensibly. Let’s Live Together has puppies for adoption all the time looking for permanent homes. People willing to adopt can contact Let’s Live Together at http://letslivetogether.org/ or call 9986413916. ESAF (The Egyptian Society of Animal Friends) has been helping the horses at Hourgada, a port on the Red Sea. 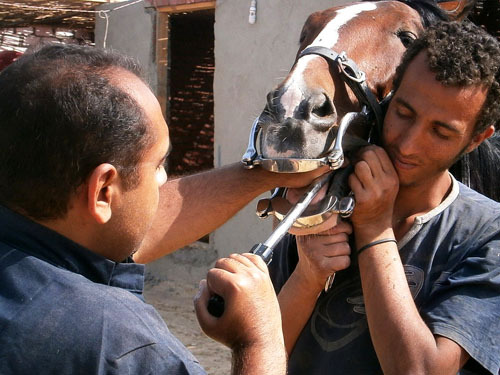 Responding to a request from Continental Rescue and Rehab, Dr. Mohammed Abd-ElHay and Dr. Mohamed Osama traveled to Hurghada on Saturday, May 12, to spend the next three days doing dentals for the horses, as well as treating cases of colic. Horses’ teeth just keep growing throughout their lives, so they really need dentals to file them down, so the teeth are even, with no sharp spurs. A good dental can give a horse a whole new lease on life. Continental Rescue and Rehab was delighted to see some of their rescued horses feeling a lot brighter and friskier. During the tumultuous days of the past year in Cairo, when there have been few tourists to provide a livelihood for the Pyramids animals, whose job in normal times is to give rides to the tourists, ESAF ran an ongoing program of feeding and vet care for the Pyramids horses, camels, and donkeys, to tide them over until the tourists return. Thanks to ESAF for taking such good care of Egyptian equines. India: Odisha: Setting baby sea turtles off on a good course in life! March in Orissa was a time for Olive Ridley sea turtle nesting and hatching. At Gahrimatha on the shore of the Bay of Bengal, 17 million expectant mother sea turtles made their way ashore to nest. Many others had nested earlier along other areas of the beach. Life is hazardous for the baby turtles who hatch and then dash pell mell towards the sea; only one out of a thousand lives to grow up and become an adult. These slim chances, however, can be increased by the care and attention of groups like APOWA (Action for Protection of Wild Animals). Many predators lie in wait for the innocent little sea turtles. Then there are the threats of hurricanes and beach erosion. Artificial lights can even cause them to head off in the wrong direction away from the sea. APOWA’s volunteers have so far rescued 5,000 disoriented baby turtles from the nesting beaches of Siali, Jatadhari and Devi, releasing them safely into the sea, thus giving them a good start in life. Their Beach Patrols keep an eye on the shores to protect the little turtles from predators and from poaching. An awareness program teaches people about the endangered turtles, and this helps prevent poaching too. To read more about the APOWA sea turtle program, click here. For information on how to donate to help APOWA save thousands of Olive Ridley sea turtles, click here. If you were disheartened to learn that there are plans to expand the largest coal mines in the world, in the Powder River Basin, in Wyoming, a little of the history of this region gives a more in-depth, though none too cheerful, picture. According to a Wikipedia article, Powder River Country lies between the Bighorn Mountains and the Black Hills. 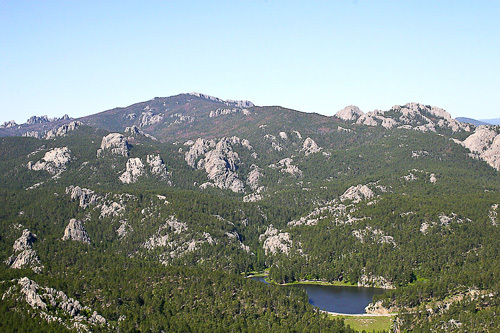 The Black Hills were sacred mountains to Native American people, including the Lakota and the Cheyenne; until the land was taken away from them, and Mount Rushmore and a number of other monuments were constructed there. In the 1860’s, Red Cloud, the Oglala Lakota Chief, allied with the Cheyenne and Arapaho people, fought a war against the U.S. military to retain control of their land, the Powder River Country. They were successful and held on to this land for the next eight years. Following the Great Sioux War of 1876-77; however, control of the land fell to the U.S. government, which opened the land to homesteading by white settlers. Later on, oil was discovered and the oil fields developed. Coal mines followed. Long gone are the days when the area was a natural tract of wilderness, a vast habitat for wildlife, in the hands of native people. There, in a nutshell, is the sad story of Powder River Country, now being strip-mined, and the largest coal mines in the world, which are located there, may be on their way to being expanded. 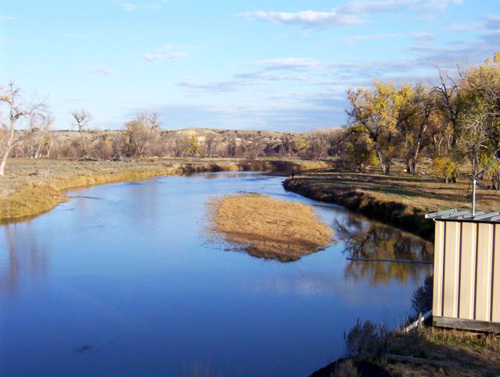 To read the Wikimedia article, “Powder River Country,” click here. Last week, WildEarth Guardians filed suit to stop a horrendous climate catastrophe from unfolding in the Powder River Basin of Wyoming: Four new coal leases that would expand the world’s largest coal mines, leading to the release of more than 3.5 billion metric tons of carbon pollution. But as powerful as our legal efforts are, we need your help to reverse the disastrous course we’re on. Sign our petition today calling on U.S. Interior Secretary Ken Salazar to put a freeze on new coal in the Powder River Basin. It’s not just because coal kills. Our federal leasing program is a massive taxpayer giveaway, to the tune of billions of dollars to huge coal companies. Worse, horrible strip mining and lax reclamation has left the land scarred. But it’s the link to global warming that has us fired up. Unbelievably, since that time Salazar has overseen the most dramatic increase in coal production in U.S. history, with his Interior Department proposing 7 billion tons of new strip mining in the Powder River Basin, enough to fuel roughly 100 power plants for the next 100 years. Already the largest coal producing region in the country, the Powder River Basin fuels hundreds of power plants, producing 13% of our nation’s carbon pollution. And increasingly, companies are not only taking billions from the taxpayers through cheap federal coal leases, but also shipping the coal overseas to Asia and Europe. Salazar’s actions would lock us into decades of more coal and more carbon, putting, as he said himself, our world—and our way of life—in peril. It’s a taxpayer ripoff and it comes at the expense of our land and our climate. It’s time put an end to this. It’s time to put a chill on new coal. Sign our petition today and demand that Secretary Salazar enact a moratorium on new leasing and mining in the Powder River Basin. the Tongue River is in the area of the Powder River Basin. We can’t strip mine our way to a safe climate. And more than ever our planet needs a good freeze. Photo: Wikimedia Commons/ “This image is in the public domain because it contains materials that originally came from the United States Geological Survey, an agency of the United States Department of Interior.” / The Tongue River, a tributary of the Yellowstone River, in eastern Montana. 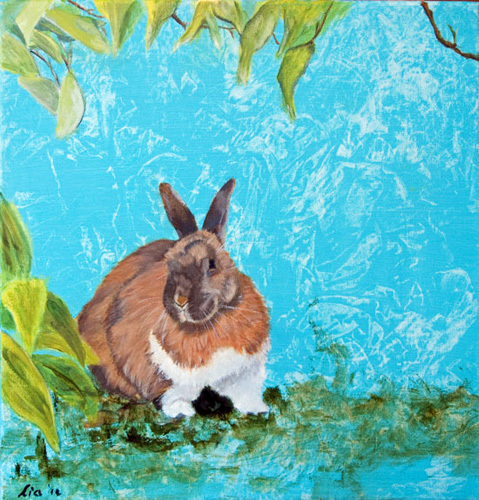 The rabbits’ person, Renee, twelve years old, requested paintings of both her rabbits. 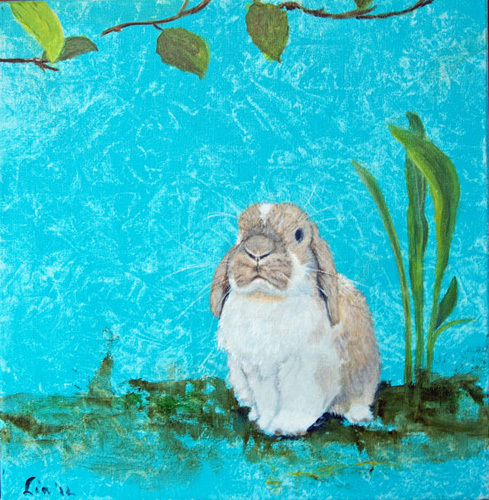 Lia Redegeld has painted the two delightful rabbits; Snuffie – top painting and Bruintje, second painting. To visit her website (in Dutch) and see more of her paintings, click here. An Associated Press article carried in the Washington Post on May 1, 2012, reports that WildEarth Guardians is challenging in court the practice by the Wildlife Service, an arm of the U.S. Department of Agriculture, of killing millions of wild animals every year. While the American public generally assumes that the government is protecting the nation’s wildlife, in fact, the Wildlife Service (not the same as the U.S. Fish and Wildlife Service, which is a different branch of government) is killing bears, coyotes, wolves, cougars, and many other species, including millions of migratory birds, and sometimes accidentally killing Golden and Bald Eagles and people’s pets as well. 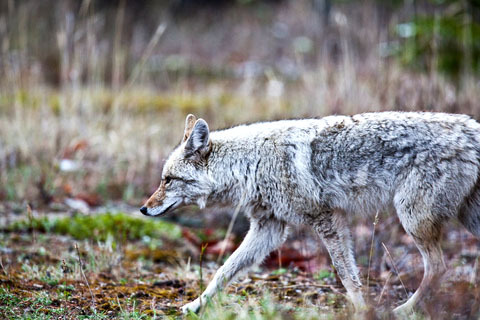 The lawsuit by WildEarth Guardians states that scientific studies which prove that predators are an essential, beneficial part of the eco-system are being ignored by the Wildlife Service, and that current environmental impact studies are not being conducted. The Washington Post reports that the agency spent $1 billion to kill around 23 million animals between 2004-2010. The killing of animals by the Wildlife Service is in response to local requests to protect agricultural crops and resources, including farm animals, from predation. The lawsuit maintains that the program benefits mostly large agribusinesses, and needlessly kills wildlife that are meant to be under government protection. The Sacramento Bee is running a very informative three-part series on this issue. Congratulations to WildEarth Guardians for taking this important step to hold the Wildlife Service accountable for the deaths of so many wild animals. To read the original article in the Washington Post, click here. For the link to the Sacramento Bee series, and to see how you can help WildEarth Guardians in their valiant efforts to protect American wildlife, click here.